On Friday 5th February 2016 at the Retromobile Salon, a rare Ferrari 335 S Scaglietti was sold by the collectors’ car department at French auction house Artcurial. The hammer fell at £24,693,782 (32,075,200€/ $35,711,359 – prices include premium), setting a new world record for a car sold at auction*. 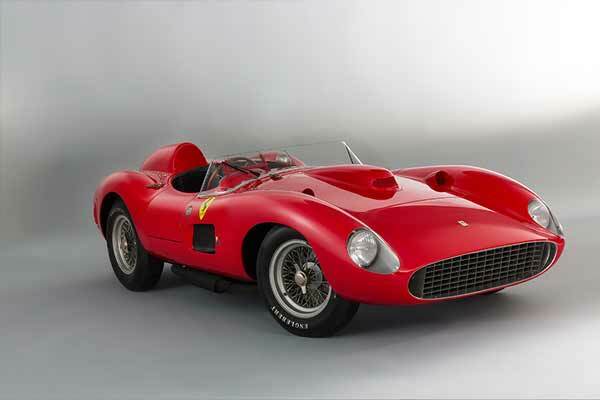 The Ferrari 335 S Scaglietti is one of the rarest and most highly-prized Ferrari sports racing cars of all time. Only five 335 S Scaglietti cars were built of which just 4 now remain (one car was destroyed in 1957 in a racing accident – see below). With Ferrari prices still very strong and opportunities to acquire a Ferrari 335 S Scaglietti few and far between, there had been an enormous amount of interest in the car leading up to the Artcurial sale and bidding was guaranteed to be fierce. The bidding started at 20 Million Euro. 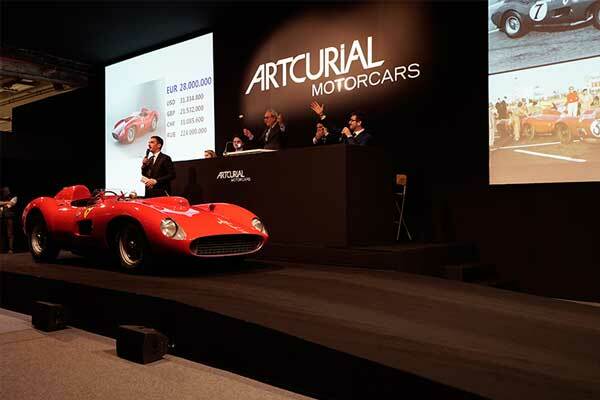 A minute later, bidding in the room and over the phone had pushed the price to 26 Million Euro. Ten minutes later it was over, an international bidder in the room triumphed over the final remaining telephone bidder and the hammer came down at 32,075,200€. 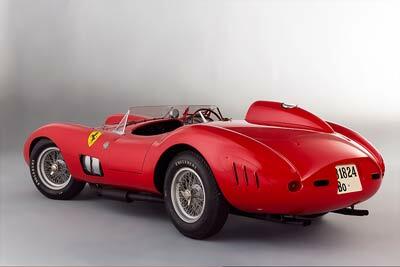 With it a 1957 Ferrari 335 S Scaglietti became the most valuable car in the world. Ferrari 335 S 0674 left the workshops at the start of 1957, clothed in hand-beaten, bodywork crafted of Carrozzeria Scaglietti. The 335 S entered the competition arena in what was truly a golden age of sportscar racing. Fast, beautiful cars raced at high speed on some of the most challenging, and dangerous, courses of all time. The car was only really active in European sportscar racing for one year before the regulations changed. Reading the list of drivers who climbed behind that wood rimmed steering wheel today, is like rolling off a list of motorsport greats. 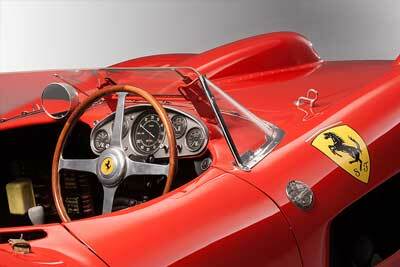 In March 1957 Scuderia Ferrari entered the car into the Sebring 12 Hours. Peter Collins and Maurice Trintignant shared time behind the wheel, bringing the car home sixth. However, Sebring was really just a warm up for the Mille Miglia in May. Ferrari lined up four cars and chassis 0674 that was given to Wolfgang von Trips, who finished second behind the Piero Taruffi’s Ferrari. On a sadder note, this was to be the last competitive year the Mille Miglia ran, in part due to the terrible crash involving Spanish driver Alfonso de Portago in another Ferrari 335S. For the 24 Heures du Mans, the car was driven by Mike Hawthorn and Luigi Musso. Hawthorn took the lead in front of the Maserati and Jaguars and set the first ever lap record over 200km/h in the history of the race (203.015 km/h average speed). Unfortunately the car retired in the fifth hour with mechanical problems. With a change in regulations, chassis 0674 was forced across the Atlantic to compete in the Americas. In February 1958 the car won the Cuba Grand Prix with Masten Gregory and Stirling Moss at the wheel (the infamous race where Fangio was abducted at gunpoint the evening before the race). During 1958, the car participated successfully in America, driven by Gaston Andrey and Lance Reventlow (creator of the famous Scarab), before being sold in 1960 to the architect Robert N. Dusek in 1960. Following this American adventure, the car was brought to France in 1970 when it was sold to world-renowned Ferrari collector Pierre Bardinon. For over 40 years the Ferrari 335 S Scaglietti 0674 remained as part Pierre Bardinon’s private collection. The collection was made up of over fifty factory Ferrari cars, spanning many of the marque’s most successful and iconic models and, for decades, considered one of the most important Ferrari collections in the world. The 1957 Ferrari 335 S Scaglietti was sold at a World Record price at Artcurial Motorcars Retromobile auction to an international collector. The next Artcurial Motorcars sale takes place on 9th July at Le Mans Classic.